Wakiso District, where HFW Uganda works, is located relatively close to the capital city Kampala. However, the baseline survey conducted in 2002 revealed that following figures of the regions we work were either about the same or below the country’s average; access to safe water and clean toilet, enrollment rate of primary education, the distance to medical facilities, the ratio of malnourished children, individual household’s income etc. 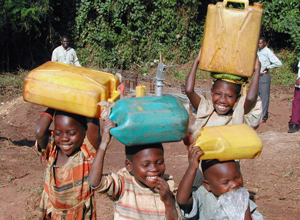 Particularly, the coverage of a well that provides clean and safe water was 2,000 to 3,000 people as of 2002. In the extreme case, Nakkedde Parish had no source of clean water. Children and women used to walk many kilos to a distant spring to fetch water. 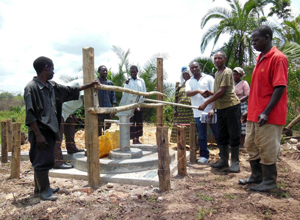 So HFW Uganda worked on building wells and public toilets. As of June 2016, we have built more than 70 shallow wells and repaired a damaged borehole. Further, we carry out water quality inspection of the wells older than 10 years. Each well is maintained by a shallow well care taker committee that is elected among community members. Fees are collected monthly from each household and used for repair. Not only did we build wells but we repeatedly emphasized the importance of keeping sanitary conditions of the well and provided trainings for how to maintain them. By securing access to hygiene water, the number of people that suffer from diarrhea or infectious diseases has decreased. In the HFW project sites, majority of the population makes living on agriculture. A body corporate has a better chance to receive support by government than individuals. 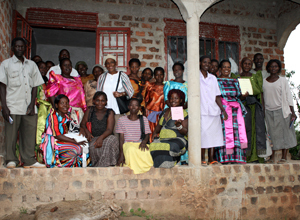 Therefore, HFW organized community groups and assisted them to be incorporated. By 2014, four groups in areas HFW works registered with the national government as cooperatives, out of which two applied for subsidies. They have broken through a 10-fold competition to win the subsidy and started new businesses such as growing better variety of maize, catering, etc. They have made smooth and profitable starts, improving the living standards of the cooperative members. 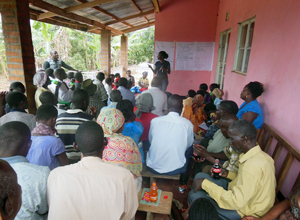 YEH (Youth Ending Hunger) members join the cooperatives and call for other young people in the region to participate, for younger generation’s income is limited in Uganda. If these successful cases spread to other regions, we can expect larger range of people to be more self-reliant. The 2013 survey to the residents on human rights awareness revealed problems such as child abuse, child labor, early marriage, discrimination against women, domestic violence by husbands. Since the concept of human rights was not yet permeated deep enough in Uganda, “the right to food”, which is important for eradicating hunger, was not understood well enough either. Therefore, HFW started with raising awareness of human rights by offering enlightenment activities and trainings for the problems such as discrimination against women and children or land ownership that are closer to home. As for the issues of land ownership, people started taking actions to change the social systems, using the knowledge they had acquired through the trainings. For instance, they sued a landowner, who tried to illegally evict the tenant farmers from the land they lived. While we continue offering trainings for “the right to food”, we keep on supporting them so that they can take appropriate actions to solve various problems.